The Duster finally let me down. First round of eliminations against Ryan Covalt. I staged and started to bring the RPMs up for the launch and it died. Wouldn’t start. Got towed back to the pits. Greg Ondayko pulled the front float bowl and found some gunk. Better, but still not right. I pulled the carb apart again sitting on the tailgate in the motel parking lot and blew carb cleaner through all of the passages. We will see if that helped enough. On a high note: Angie won her first round to take the lead as Rookie of the Year!! 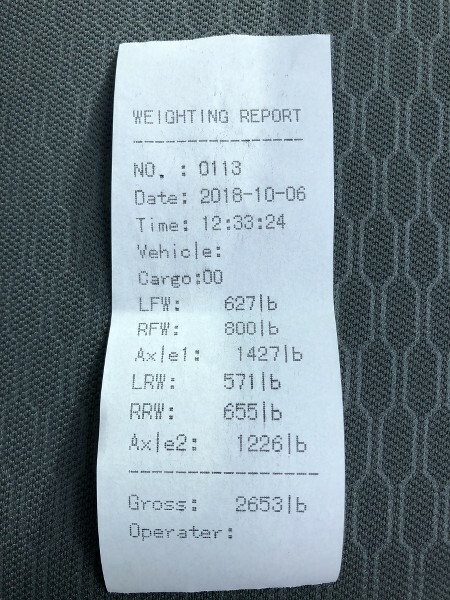 Rick Covalt let her drive his truck. She had a blast and wants to start racing now!! Good day of racing today. Carb is good/better. It doesn’t idle as well since I messed with the bleeder screws, etc. Still good enough for Runner Up and a break out. Still very consistent. Just needs a more consistent driver. Angie may want to try her hand at the Duster next. I decided to save the Nitrous record for Knoxville. Hopefully that won’t come back to bite me. 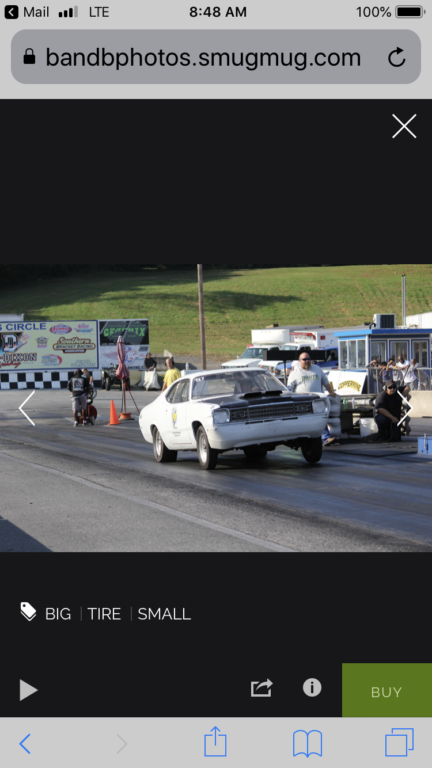 Jack Everhardt Jr. wants to take some weight out of his car and go for the same B/Nitrous record. If I set it this weekend he likely wouldn’t be able to re-set it, so I told him I would wait. It will make Knoxville that much more exciting. I hope to be in Knoxville also and may go for that record. Love that juice. You’d better get it weighed then. Raccoon Valley is gonna smell like nitrous for a week! I had posted this in the Mason-Dixon thread. The Duster with me, a full fuel cell and the full nitrous bottle in it weighs 2,653 pounds! Mason Dixon has a new scale that even gives corner weights. This makes me want to start cutting more weight out! Hey Greg! Ya wanna bring a hole saw and sawzall and hang out at my place for a few days...? Cranking up the right side torsion bar a little will balance your weights out better. I was thinking about that when I saw those corner weights. Thanks Dennis! Or maybe I'll do a little more tweaking to things before I even it up! 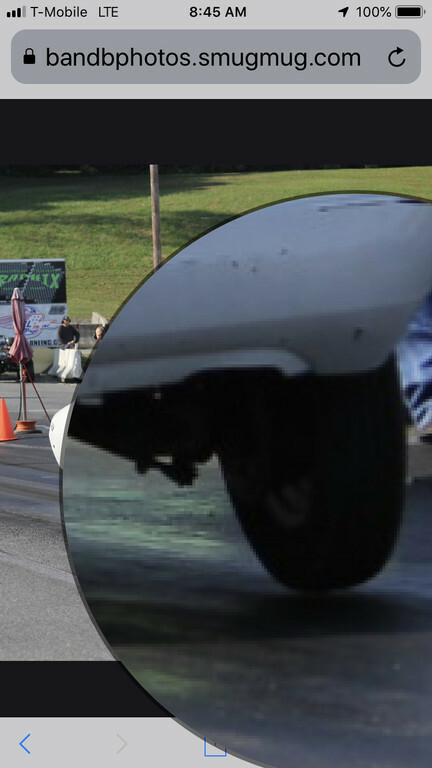 Ryan sent me a link to a photo of me leaving the starting line at Mason-Dixon and it looks like the Duster actually pulled the left front tire off the ground just a tiny smidge! If he fixes his corner weights it will probably not do it. Got some air - nicely done Mater! I’ve still got 46 pounds I can add and stay in B class... Put that in the back and twist the bars even further in the wrong direction... That oughta do it! You may need wheelie bars!! No damage that I can tell, but the water and fuel are drained now. We had a decent ice storm last night that downed a lot of trees. Several large branches fell near and on the Dart and Valiant. I didn't see any major damage while I was moving the frozen branches to get to work this morning. The ice was still coming down, so I didn't dawdle... The car covers are ripped up, so I imagine there is at least some damage there. More to follow. Have I mentioned that I miss living in Arizona...?